NEW YORK -- Colorado Avalanche center Matt Duchene, who led all rookies in scoring with 13 points (five goals, eight assists) in 14 games, has been named the NHL Rookie of the Month for December. Duchene edged Anaheim Ducks right wing Dan Sexton (6-5--11), New Jersey Devils right wing Nicklas Bergfors (7-3--10), Avalanche left wing T.J. Galiardi (3-5--8), Buffalo Sabres defenseman Tyler Myers (0-8--8) and Detroit Red Wings goaltender Jimmy Howard (6-4-1, 1.90 goals-against average) for the award. 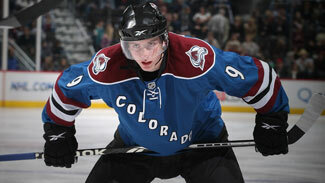 Duchene tallied points in nine games as the Avalanche posted an 8-5-1 record. He opened the month with his first NHL three-point game, notching two goals, one assist, a +3 rating and season-high seven shots in a 6-5 shootout loss at Florida on Dec. 2. Combined with his two-goal game at Tampa Bay on Nov. 30, Duchene became the first 18-year-old to tally multiple goals in consecutive games since Florida's Radek Dvorak in November 1995. He finished the month with points in six of his last seven games, capped by a two-assist effort in a 4-2 loss at Detroit on New Year's Eve. The third overall selection in the 2009 Entry Draft, Duchene has moved within one point of the NHL rookie scoring lead thanks to a run of 20 points (nine goals, 11 assists) in his past 22 games. The Haliburton, Ont. native has 27 points (11-16--27), trailing 2009 first overall draft pick John Tavares of the New York Islanders (16-12--28).